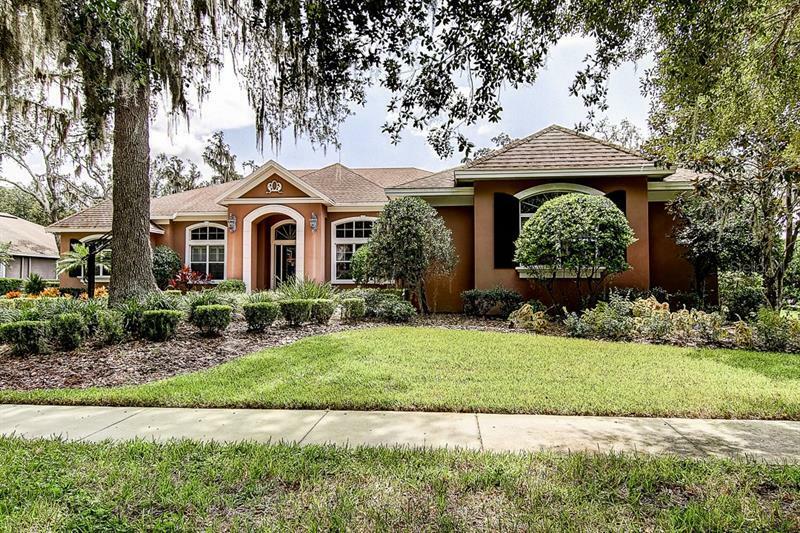 Custom built executive home in the gated Fishhawk Ranch village of Dunlin Wood. Offering over 4900 square feet with 4 bedrooms, a study, media room and 4 bathrooms this fantastic home was built to impress. Entering the home the home you'll notice the high coffered ceilings that accent the formal living and dining areas. As you continue through you'll find the gourmet kitchen with granite counters, a center island, wood cabinets, stainless steel appliances, walk-in pantry, a dinette area overlooking the pool deck and opening to the very generous sized family room. Ideal for entertaining, there is access from both the formal and family areas onto the pool deck featuring a outdoor kitchen and bar with both covered and open seating areas. The master suite offers a sitting area with oversized windows and access to the lanai and a luxurious master bath with an octagon shaped dual shower, a jetted tub and two vanities. The remaining bedrooms are all located on the first floor. The media room with wet bar is located on the second floor. All this in a community with the county's top rated schools and neighborhood amenities such as clubhouses, an Aquatic park, playgrounds, pools, volleyball, skate park, trails and more.